We've talked about using Meshmixer to design prosthetics and now have an interesting story from the Toshiba Stroke and Vascular Research Center in Buffalo, New York. 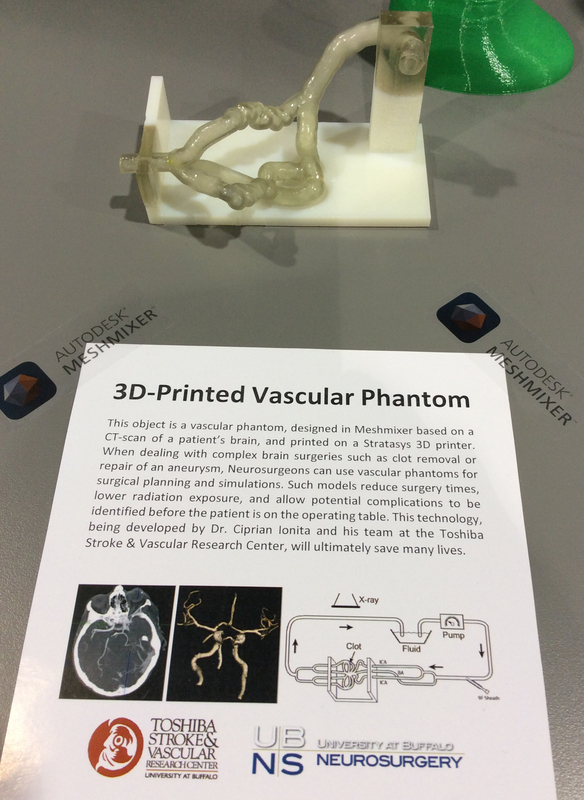 Dr. Ciprian Ionita and his team have developed a method to create 3D-printed vascular models (or "phantoms") using Polyjet printing technology from Stratasys. The polyjet process can create flexible objects that mimic the feeling of human tissue. Neurosurgeons are using these models for planning complex procedures such as repair of brain aneurysms. The process begin with a CT scan of the patient's brain. Biomedical engineers extract the critical regions of the vascular (blood vessel) network as 3D surfaces. These surfaces are imported into Meshmixer, and are used as the basis for designing a printable model which the surgeon can inspect. The model can also be connected to pumps which mimic blood flow, and placed into a simulated surgical environment. These planning steps allow life-threatening complications to be identified before the patient is on the operating table. In the video below, Dr. Adnan H. Siddiqui from the Jacobs Institute describes how one of these models was used to save a patient's life.